Samosas are wildly popular among Indians and are commonly served as appetizers or snacks. They are also loved by non-Indians, which makes them a good item to serve in mixed crowds, even with relatively unadventurous eaters. Who doesn't like deep fried stuffed pastry? In the Ismaili community, we make samosas that are relatively small (3-4 inches on the edge), flat and have a medium-thick pastry. Those of you living in North America are probably more familiar with the baseball sized, thick-pastry variety which are served in Indian restaurants. When I was young my mom would make meat and vegetable samosas from scratch. Later on, we would buy uncooked versions and fry them up for our guests. My mom, who is a health nut, started to bake them, which was much healthier and prevented a 'deep fried smell' in the house. While the recipe below is not hers, I take insipiration from her artery-friendly methods. Although most commonly associated with India, samosas originated in Central Asia before the 10th century, and were introduced into the Indian subcontinent by traders in the 13th and 14th centuries. The word can be traced to the Persian word sanbosag. Other names include sanbusak in Arab countries, samsa in Turkik languages, sambosa in Afghanistan, sambusa in Iran and chamuça in Goa and Portugal. Due to migration and globalization samosas are now popular in Southeast Asia, East Africa, United Kingdom, North America and the former Portuguese colonies of Africa. Samosas are usually triangle-shaped pastry shells stuffed with vegetables, potatoes or beef. Variations abound including chicken, fish, lamb, pork, pumpkin, paneer or cheese. Apparently, sweet versions are also produced in some places. In addition to different fillings, the pastry varies significantly from delicate phyllo dough to thick pastry crusts. Traditionally samosas are deep fried, though in many Western countries they are now baked. I would not recommend frying this phyllo version due to the delicacy of the pastry. 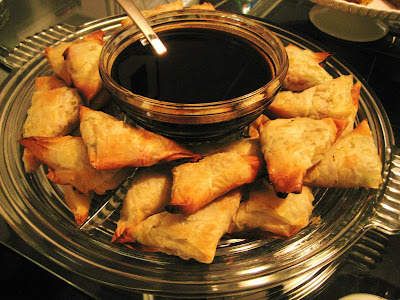 If you want deep fried samosas, use commercially available samosa wrappers (you can also use spring roll pastry or wonton wrappers) which are made from a thicker dough. Samosa are usually served with chutney. I prepared a tamarind version but mint or coconut/cilantro chutneys are also popular. 1. To make the tamarind chutney place all of the ingredients in a medium bowl or large lidded jar. Mix or shake well. The chutney can be prepared ahead and will last in the refrigerator for a week or frozen for three months. To defrost, thaw overnight in the fridge. 2. To make the samosas, boil potatoes until almost cooked. Cool to room temperature. Can be done a day in advance but make sure potatoes are at room temperature for this recipe. 3. In a large pot, heat oil on medium. Add mustard seeds and curry leaves. When mustard seeds pop, add onions, potatoes and vegetables. Cook on low heat until tender. 4. Add the next eight ingredients and continue cooking for 2-3 minutes. 5. Remove from heat and set aside to cool to room temperature. Once cooled, add cilantro and mix well. Set aside samosa filling. 6. Melt one stick of butter in the microwave or on the stovetop. Once melted, unpack and unroll the phyllo sheets. Cover the sheets with a damp (not wet) towel to keep them from drying out. You will have to work quickly once the phyllo is unwrapped. 7. Place one sheet of phyllo on a clean work surface (a cutting board works well) and brush liberally with butter. Place another sheet on top and brush with butter. Cut the sheets into strips that are approximately 3 inches wide and 9 inches long. 8. Make sure the strips are laid out vertically. At the end of one strip place 1 to 2 tablespoons of samosa filling. Fold one corner in to fully cover the filling (thus forming a triangle tip). Now fold over the section containing the filling twice, making sure to keep it from falling out. Brush all visible surfaces with butter before folding once more. Fold the remaining phyllo over and use additional butter/oil to seal the samosa. Melt more butter if necessary. 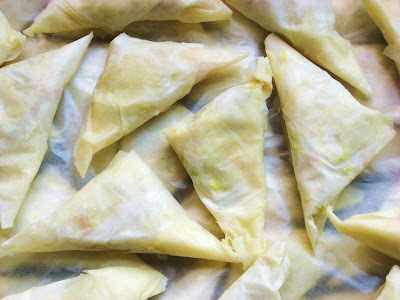 Click on this recipe for Spanakopita Triangles to see photos of the process step-by-step. 10. Repeat with other strips of phyllo and then with all phyllo sheets. 11. Bake at 375F for 20-25 minutes or until golden brown. Serve warm. 12. Leftovers can be refrigerated and reheated in a toaster oven or oven (do not use a microwave as samosas will become soggy). Alternately, unbaked samosas can be frozen immediately and baked when needed (bake from frozen, do not thaw first). I made these for a party last night and they were amazingly good. I loved the phyllo dough as it allowed for crunchiness despite baking them.